Ten researchers were inducted into the next class of PI Millionaires, a designation given to RIT researchers who have achieved funding of $1 million or more since 2000. Here some of the awardees stand with David Bond, left, director of the Sponsored Research Services office, and Ryne Raffaelle, right, vice president for research and associate provost. 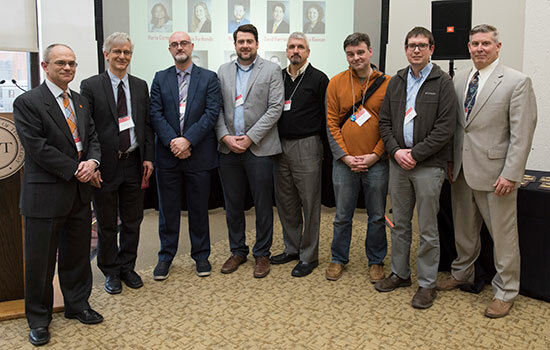 Rochester Institute of Technology honored researchers who served as principal investigators on active awards in fiscal year 2017 at an April 18 reception. Also recognized were the 19 recipients of Seed Funding Awards and 10 new inductees in RIT’s PI Millionaires. RIT investigator efforts led to $60 million in research funding in the 2017 fiscal year. Seed funding awards are $5,000 grants given to proposals written over the fall semester and refined over the course of a two-day Grant Writers’ Boot Camp. Proposals are reviewed by teams of peers and revised to better position awardees for external funding. Jessica Trussel, assistant professor, National Technical Institute for the Deaf. Ben Zwickl, associate professor, College of Science . The celebration event, in RIT’s Fireside Lounge, was hosted by Sponsored Research Services, which has recognized 127 PI Millionaire researchers since 2001. For more information on research at RIT, go to https://www.rit.edu/research/.